Automotive Resort With Hotel and Race Track Being Built In U.K.
Fed up with Disney World? Want to go on holiday to the closest thing to petrolhead heaven? Well, soon that dream might become a reality after plans for a new resort on the Bicester Heritage site were submitted. The former Royal Air Force base has become something of an automotive hub in the last five years after 35 classic and vintage car specialists brought the site back from a state of disrepair. 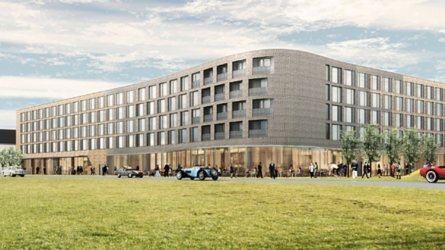 Now the site could grow into a “unique automotive resort” after plans for a 344-room hotel were submitted. The hotel will feature expanded steel mesh covering the curve of the building in homage to RAF Bicester’s past as a camouflage training center. The design of the building will follow the lines of adjacent hangars but it will have a contemporary design. The hotel will have a top-tier restaurant, bar, courtyard, gym, swimming pool and sauna, and it will offer an immersive experience for car enthusiasts, featuring cars of the past, present, and the future. The Hotel’s four-storey atrium will also showcase rotating automotive themed exhibitions and displays. In case you’re wondering, yes hotel guests will get access to Bicester Heritage’s track. “We very much look forward to welcoming enthusiasts to our motoring hotel, from which they will be able to experience a range of automotive destinations on a single site, from the existing centre of excellence for historic motorcars to private track, exhibition hangars, OEM brand centre and future technology,” said Dan Geoghegan, Managing Director of Bicester Heritage. The hotel is being designed by leading British designer and car enthusiast Dexter Moren, who is using the dimensions and orientation of the 1936 C-Type hangars on the site. The hotel is the latest in a long line of developments at the Bicester Heritage site, following on from a fifty-building evolution of the historic section of the site. Next to follow at the 425-acre resort will be motor lodges and luxury leisure residencies. Next Next post: Ford To Reveal A New Performance Vehicle – Is It The EU-Spec Ranger Raptor? Vehicle Traveller Automotive Resort With Hotel and Race Track Being Built In U.K.